1902: British Motor Racing was born, in Bexhill-on-sea, when the 8th Earl De La Warr encouraged the Automobile Club of Great Britain and Ireland to organise the ‘Great Whitsuntide Motor Races’. Having business interests in the tyre-making firm Dunlop had led the Earl to create a Bicycle Boulevard on the seafront in 1896, which stretched from the Sackville Hotel in the west to Galley Hill in the east. He turned this bicycle track into a one-kilometre motor racing course in 1902 as, being his own private land, it was exempt from the national speed limit of 12 miles per hour. 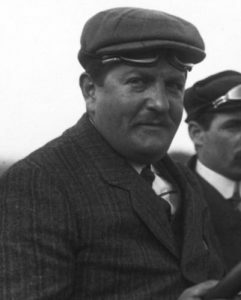 The races helped bolster his attempts to put Bexhill on the same level as Monte Carlo as a seaside resort for the jet set, and was the first motor racing seen in this country. The 1902 races were won by French driver Leon Serpollent in his steam car Easter Egg, which reached a speed of 55 miles an hour (a replica can be seen at Bexhill Museum). The motoring events lasted until 1907, when the Brooklands motor racing circuit was opened in Surrey, coinciding with Bexhill residents finally getting fed up with the noise of the infernal contraption engine! 1933: Otto Merz (33), winner of the 1927 German Grand Prix, was killed when he crashed at the Avus Circuit in Germany. A few minutes after 13:00, Merz crashed his SSK on the long straight, near the Grunewald station and nearly two kilometers away from the finish line. At the place of the accident the surface changed from cobblestones to tarmac, and traces of the car trajectory were clearly visible on the cobblestones – but suddenly ended. The next mark left by the vehicle was found 36 meters further on, where the car hit the ground again. The Mercedes-Benz crashed into a cement milestone on the right side of the track, and, according to the single eye-witness, it somersaulted and rolled several times. The car stopped with its wheels in the air near an embankment. Ejected from the car, rescuers found Merz on his back on the right side of the track. He was transported to the Hildegard Hospital at Charlottenburg, a suburb of Berlin and very near the accident site, but his condition was beyond help. 1957: Despite a hesitant start to the Monaco Grand Prix, Stirling Moss led away on the first lap from Peter Collins, Manuel Fangio, and Mike Hawthorn. On lap 4 coming out of the tunnel, there was mayhem. Moss went straight through the chicane, sending debris from the wrecked barrier crashing onto the circuit. Collins crashed through the quayside barriers trying to avoid it. Fangio and Brooks slowed to make their way through the carnage. Brooks’ effort was for nought, being hit by Mike Hawthorn’s Ferrari, which lost a wheel. Fangio took the lead from Brooks’ damaged car and held it to the checkered flag. 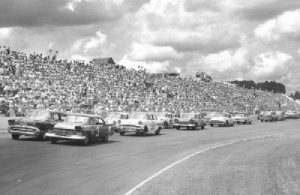 1957: Buck Baker was declared winner of the Virginia 500 at Martinsville Speedway after a crash halted the event on lap 441 of the scheduled 500-lapper. 1958: Archie Scott Brown (31) was mortally injured following an an accident in a sports car race at Spa-Francorchamps, driving a Lister Knobbly and duelling for the lead. He was born with severe disabilities, a result of German measles suffered by his mother during pregnancy, and had no proper front forearm and both legs were radically twisted. But Archie had an enormous talent to drive cars very fast. In fact, many who saw Archie race had no idea he had a disability, such was his skill behind the wheel. He teamed up with Cambridgeshire engineer, Brian Lister, to create a very competitive racing team. Archie even took part in one round of the Formula 1 World Championship at the 1956 British Grand Prix at Silverstone in a Connaught B-type. 1963: John Surtees and Willy Mairesse drove a Ferrari 250P to win the ADAC 1000 km race at the Nurburgring in Germany. 1973: On a 600ft long strip Dennis Priddle put in some demo drag racing burnouts and launched in his ‘Mr Six’ slingshot at the Goodwood circuit. Southern TV recorded the action which was shown on the evening news and the ‘Day By Day’ programme. 1985: Alain Prost driving a McLaren-TAG Porsche MP4/2B won the Monaco Grand Prix. 1986: Alan Bates in Nobby Hills Corvette was credited with a 5.99 second run, the first five second Funny Car run at the Sanata Pod Raceway. The run was dismissed by some that saw it as being a mid-six second run although it is often credited as being the first UK Funny Car five. 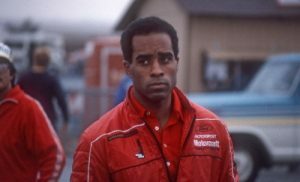 1991: Willy T. Ribbs became the first African-American driver to qualify for the Indianapolis 500. Ribbs, a Californian, objects to the obstacles placed in front of African-American racers: “Here we are, moving into a new millennium, and auto racing still looks like 1939 baseball.” Ribbs’s achievement at Indy is especially remarkable, as the cost of running at Indy normally deters racers who don’t have powerful corporate sponsors. While stock-car racing is more accessible financially, the sport hasn’t fared any better in attracting African-American participants. NASCAR officials, however, don’t feel the lack of African-American racers is a reflection of racism within the sport. Longtime President Bill France explained his case: “America is what America is today. Anybody can be anything, regardless of your race or your national origin. You can’t cast a wand and make everything happen that somebody wants to happen.” In the 50 plus years of NASCAR history, only Wendell Scott ever won a race. One explanation for the dearth of African-American racers is that car racing is a hereditary sport. Most racers come from racing families. By that criterion, however, the Scott family could have continued racing. Wendell Scott, using secondhand equipment, set the sport on fire 25 years ago with his fearless attitude and abundant talent. “Had the sport offered more help to the Scotts, others would have been inspired by us in another generation,” said Wendell Scott Jr. “They nipped us in the bud.” An example: In 1963, Scott won a race in Jacksonville, and the race officials, fearing a reaction from the crowd, presented the trophy to another driver. They gave Scott the trophy after the crowd had left. Ribbs also believes that corporations are reluctant to offer sponsorship to African-American drivers, because they don’t believe these racers will be financially beneficial to their brands. Even the NASCAR team owned by former NFL running-back Joe Washington and former NBA legend Julius Erving cannot guarantee an African-American driver behind the wheel of its car. Washington and Erving started the first wholly minority-owned team since Scott and his sons left competition over 25 years ago. Kathy Thompson, a representative for the team, explained their predicament: “To get into a Winston Cup car is dangerous. I wouldn’t want to race against Dale Earnhardt or Jeff Gordon without experience. That’s suicide. I wouldn’t want that on my conscience, somebody getting out there who wasn’t ready.” The fact remains that large African-American communities exist in the regions where NASCAR’s fan base is strongest. It wouldn’t take much for NASCAR to foster a more openly encouraging attitude toward minorities in racing–and who knows, maybe the sport will be rewarded with a great champion. Baseball came a long way after 1939. 1996: The Monaco Grand Prix was run in wet weather, causing significant attrition and setting a record for the fewest number of cars (3) to be running at the end of a Grand Prix race. Olivier Panis scored his sole career Formula One victory, earning the last ever Formula One victory for the Ligier team (and the first ever for engine manufacturer Mugen Motorsports) after switching to slick tyres in a well-timed pitstop. 1997: Troy Ruttman (67), the youngest winner of the Indianapolis 500, at the age of 22 years and 80 days, died. He led several of the 12 Indy 500s in which he participated, but was a frequent victim of mechanical failures. Ruttman retired from racing following the tragedy filled 1964 Indianapolis 500. His son, Troy Jr., became a race car driver as well, but was tragically killed at the Pocono Speedway in 1969 while driving the car his father drove from the 33rd starting spot to a 12th place finish in the 1963 Indianapolis 500. 1903: The first commercial vehicle race began in New York City, with two races on two days sponsored by the Automobile Club of America (ACA). The light truck winner for both races was a Waterless Knox driven by Harry Knox, while the heavy truck winner for both races was a Herschmann steamer. 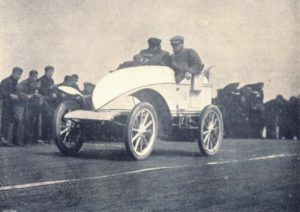 1904: Léon Théry won the Gordon Bennett Elimination Trial at Argonne, France, driving a Richard-Brasier 80 hp car. 1905: The first races are stage at the Hippodrome in Morris Park, Bronx, New York, US. Louis Chevrolet made his racing debut, and won two of the three races in his 90 hp Fiat – the White steam-powered race car, ‘Whistling Billy’, driven by Webb Jay, made its debut and covered a mile in 53 seconds during an exhibition run. 1920: Sir Henry Segrave, driving his 1914 Opel 1.4 litre Grand Prix car, won his debut race at Brooklands. 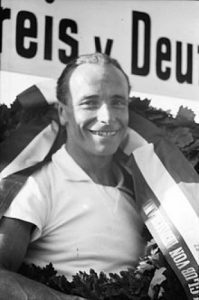 1950: Juan Manuel Fangio won the Monaco Grand Prix in an Alfa Romeo 158, the first of 24 Formula 1 Grand Prix victories. 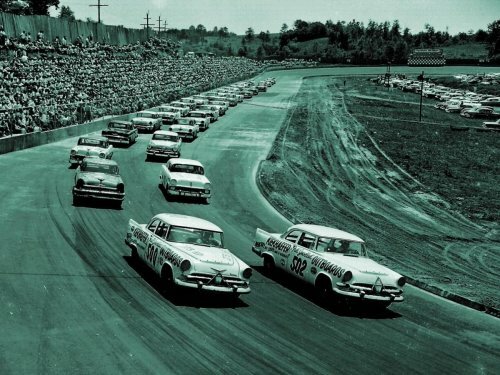 1956: Buck Baker started from the pole position and won the Virginia 500 by half a lap at Martinsville Speedway, Virginia, US. Speedy Thompson led 259 laps and finished second in a 1-2 finish by Carl Kiekhaefer-owned Dodges. Lee Petty was third, three laps off the pace. Baker, who led 125 of the 500 laps in his 19th Cup win, drove a car numbered 502, which remains the highest number to win a race in the history of NASCAR’s premier series. 1962: The Dutch Grand Prix held at Zandvoort was won by Graham Hill driving a BRM P57. It was the first Grand Prix victory for the future dual-World Champion and the second time a BRM driver had won the race after Jo Bonnier in 1959. Hill finished over 27 seconds ahead of Team Lotus driver Trevor Taylor driving a Lotus 24. 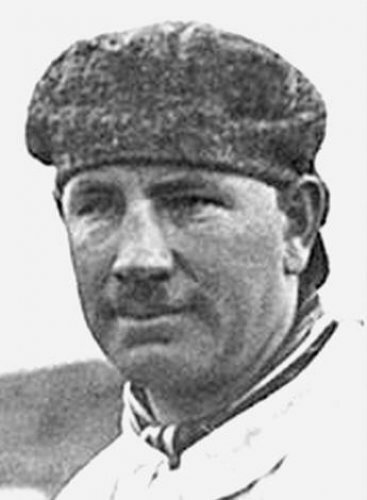 The reigning World Champion, Ferrari’s Phil Hill (Ferrari 156) completed the podium. 1964: Bill Holland (76), winner of the 1949 Indianapolis 500, died in Tucson, Arizona, US. An AAA championship driver from 1938 to 1951, then again from 1953 to 1954, he scored 20 victories, including 17 in the 77-race 1946 season, scoring three top-five championship finishing positions, the best being second place in 1947. He competed in the Indianapolis 500 five times, including three while it was a Formula One championship race, winning the race in 1949 and finishing second the two previous years as well as the following year. 1965: Edgar Barth (48), German driver, winner of the 1959, 1963 and 1964 European Mountain Championships (Hillclimb) for Porsche and also the 1959 Targa Florio, died. 1973: The Belgian Grand Prix at Zolder was won by Jackie Stewart driving a Tyrrell-Cosworth 006 (cover image). The entire Zolder track had to be resurfaced a week before the actual Grand Prix after a few drivers such as Jackie Stewart, Emerson Fittipaldi and François Cevert walked around the track to inspect it. They found that the track started to break up as a result of a previous race, and the track owners immediately decided to resurface the track, only a week before the Grand Prix. Cevert, Fittipaldi and Stewart refused to drive on the track because of the danger, and Cevert responded to the FIA that they would attempt to cancel the race if the owners did not do a good enough job of fixing the track. 1984: The 5th French and 6th and last ever World Championship Grand Prix was held at the 3.801 km (2.361 mile) Dijon-Prenois circuit as it was deemed too short by the governing body FISA (circuits where lap times were under 60 seconds were considered too small for Grand Prix racing). With speeds increasing, it was felt that another race at Dijon would see the cars lapping in under one minute. Dual World Champion Niki Lauda won the race in his McLaren-TAG, his first win in France since 1975. 2007: The record Le Mans-winning 1962 Ferrari 330 TRI/LM Testa Rosa Spyder was auctioned by RM Auctions and Sotherby’s for €6,875,000.